Just so we’re all on the same page here, what is a juice detox? It’s a regimen to help flush toxins from the body by fasting from solid food and getting your nutrients from juices only. The exact specifics aren’t set in concrete, and some people prefer not to fully fast but simply boost up their juice intake for a period of time while eating healthy, natural foods. For our purposes here, we’re taking the fasting approach and going juice-only. Plan out what kinds of juices you want to have during your detox and stock up on all the ingredients. Find some good juice recipes before you go and make up a shopping list. If you wait until you need something, that means you’ll have to be at the supermarket during your fast, which can be more temptation that some of us can deal with. A big load of fresh fruit and vegetables, along with ginger or mint, should get you through your detox. Going for days just on fruit juices will be light on certain nutrients and have more sugar than you are going to want. 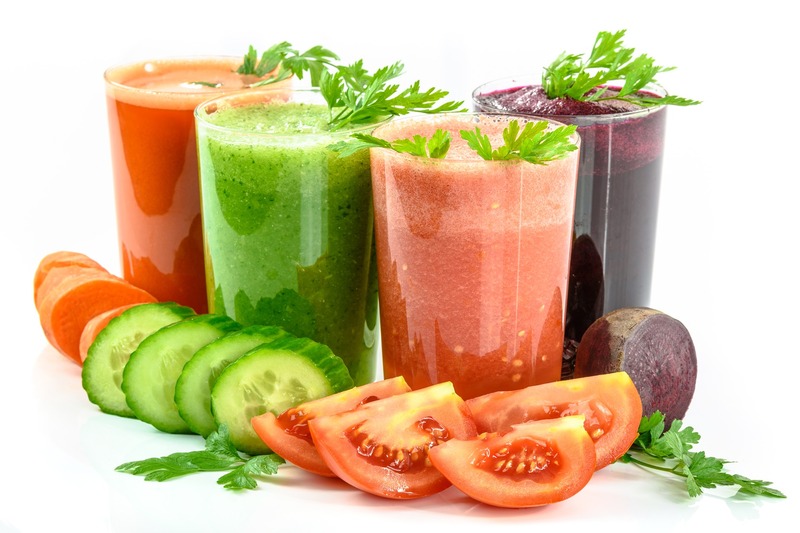 Vegetable juices of all kinds should be on the menu, with a heavy focus on the leafy greens. Wheatgrass, spinach and kale will add iron and calcium to your nutrient intake, which you won’t get from most fruits (remember that you will need a masticating juicer such as the Healthy Juicer). What about smoothies? Well, the point of a juice detox is to let your digestive system take a break, and thick dairy-heavy smoothies aren’t the best choice. On the other hand, a smoothie that is mainly juice would be fine. A smoothie (any kind) will be better than solid food during your fast, and it can help give you a little energy boost and get rid of nagging hunger. The most important part of a detox is the flushing, to cleanse out your system of accumulated toxins. The more water you can drink the better. Yes, you’re getting water in your juices but that’s not enough. Pure water is exactly what your body needs, so make sure there are several glasses of that going own along with your juices. Add a little lemon if you want a chance of taste. Your mood and energy levels will be effected during a juice fast so don’t expect too much from yourself while you’re doing it. Tone down your regular workouts, and don’t commit yourself to stressful social situations. Take it easy and let your body relax. That’s kind of the whole point. Trying to go 14 days without eating anything (especially if you are new to fasting) is just setting yourself up for failure and frustration. Start your first detox with just a day or two. You might want to talk to your doctor too, just to be on the safe side. You’ve spent your allotted time drinking water and fresh juice, leaving your body refreshed and hydrated. Don’t leap right into a platter of greasy nachos as soon as you’re back on solid food. Ease back into your usual diet with lighter and healthier fare. Try a few meals with rice, cooked vegetables and some chicken or fish. I have been juicing for a few months now and just started a 3-5 day juice fast, I’m on day 2 and going strong so I think I can do the 5 days. I have currently have an electric juicer and have been wanting to buy a cold press juicer but they are usually so expensive. I’m so excited I found this page and ordered immediately. I can’t wait to start juicing the healthy way!!! Great!!!! SO happy you found us :) We hope you love the Healthy Juicer.